Does your organisation have business processes that are inefficient or time-consuming? Of course, every organisation does. But do we have the right tools to quickly create better processes? Probably not. But now there is software that can help us to automate and optimise virtually any business process quickly and effectively . What is SAP NetWeaver Process Orchestration? SAP NetWeaver Process Orchestration solution provides a full tool box, including process management, business rules and integration capabilities so we can create, run and integrate new processes and optimise them for continuous improvement. From the creation of simple workflows to more complex processes that span multiple applications, geographies and organisational bodies, SAP NetWeaver Process Orchestration provides the support we need. Best of all, we don’t have to start from scratch. We can reuse building blocks from other applications, such as the SAP Business Suite therefore, we can build differentiating processes, while capitalising on your existing IT investments quickly, flexibly and at a low cost. 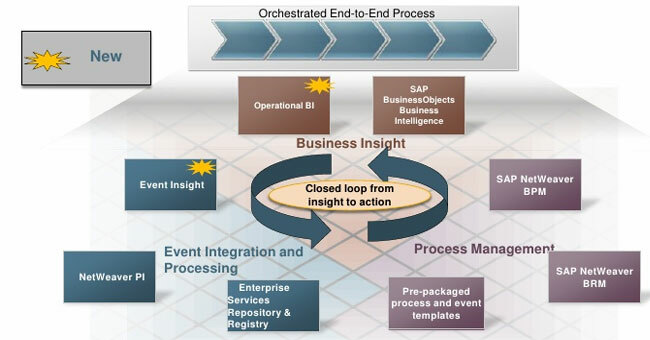 SAP NetWeaver Process Orchestration supports every stage of the business process lifecycle, from modelling to implementation,execution and monitoring. So we can not only operate the business the way we want but also drive continuous process improvement. How SAP NetWeaver Process Orchestration Works? SAP NetWeaver Process Orchestration supports a model-based development approaching instead of coding. In fact, business and IT specialists can now create and adopt processes together, with the user-friendly business process model and notation standard. Using the modelling capabilities, we define the task that makes up the process go and how those tasks should be sequenced and accomplished. For example, we can choose whether a task should be performed by a specific person or can be automatically performed by an application. Once the process has been modelled, IT professionals can augment it with technical details that turn it into a software application. For instance, we can create user interfaces for the tasks that need to be performed by people. These interfaces can be created using a variety of technologies from SAP and other providers. We can also develop user interfaces that can be accessed by any device, including mobile phones and tablets. For tasks that will be performed by the application, we can easily connect to service enabled applications from SAP and other software providers. In addition, some steps in the process might require a more complex flow of information to happen automatically in the background. For example, to exchange information between applications within the organisation and with your business partners. SAP NetWeaver Process Orchestration, therefore, offers a standard space, high-performance enterprise services thus to exchange information across distributed business applications and it provides us with application-specific and industry-specific adaptors for interacting with business partners over the Internet. SAP NetWeaver Process Orchestration comes with powerful business rules management capabilities. Business rules make it easy to automate decisions and enforce policies. For example, we can determine whether a task should be handled internally or outsourced to a partner, or we can automatically calculate a customer discount or determine who should be assigned a task based on priority, availability and work load. Once more, business rules are easy to edit, so we can respond quickly to changing needs. They can even be maintained by business users without assistance from your IT staff. After a process has been designed, SAP NetWeaver Process Orchestration provides full support for execution. In the past, a new process had to be painstakingly coded before an application could run. But with SAP NetWeaver Process Orchestration, no additional coding is needed to execute business processes. To help we identify potential bottlenecks and gain transparency into your processes, SAP NetWeaver Process Orchestration provides full monitoring and analytical capabilities, and if we want to change your process, we simply change the process model or the business rules. It's as easy as that. SAP NetWeaver Process Orchestration enables your team to work together more effectively from process design to implementation, and it can help we reduce the time needed to design, integrate and adapt processes. In fact, thousands of organisations are already achieving valuable results by using SAP NetWeaver Process Orchestration. For example, customers have reported a 60% reduction in processing times, development times that are twice as fast as traditional approaches and a 67% reduction in integration efforts.